Thanks A separate thread for the GBC Akiyuki Train System (as shown in the next post by Jonas) for discussion and for posting improvements, modifications, new compatible modules etc. Update of modifications & improvements for the GBC Train System. A list of Improvements and modifications made to the various Akiyuki Train GBC modules plus new compatible modules and stand alone modules. The modifications have been proven and tested. More information can be found in later postings on this topic. 1a/. 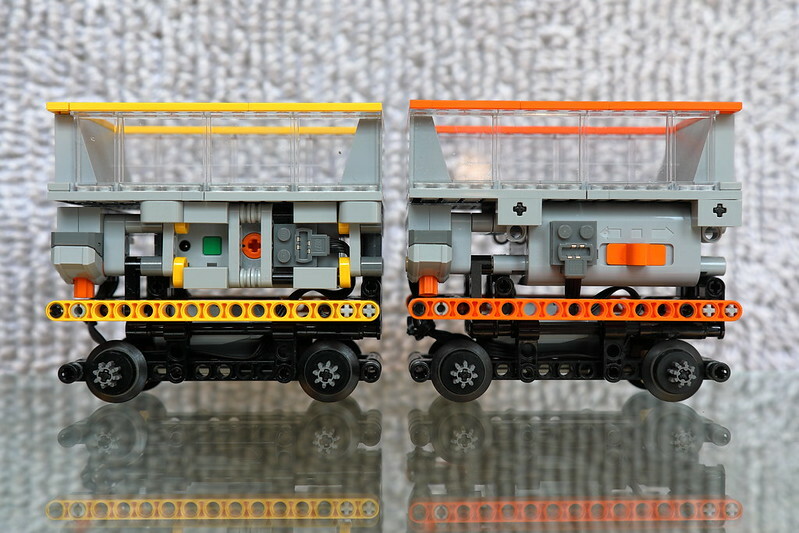 Train unit (Ver2) with electric switch:- Mod by Doug72 with contribution by Courbet. Replaced by a single 9L axle. MOD by Courbet for improved PF cable routing. See pages 25 & 26 for details. With contributions from @dunes, @MajkiSpajki, @Berthil. Modified version:- by Doug72 With contributions from @dunes, @MajkiSpajki, @Berthil. 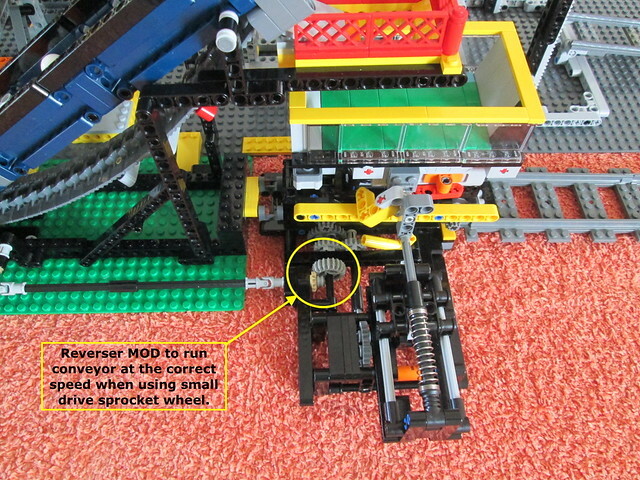 The unreliable cam lock system eliminated and replaced by synchronised gearing to rotate both the rotating dumper and to trigger the train reverser when at the correct position to allow train to exit. A fixed double 140T gear ring is used with a new drive system for rotating the dumper & train. Train reverser re-designed and the shock absorber replaced by two rubber bands. 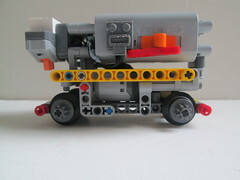 Adapted Akiyuki base to fit the modified Rotary Dumper & devised a way to shorten the triiger arm by 1/2 L.
The complicated and hard to tune Latch system with associated trip levers etc, removed and replaced by two simple trip levers to hold the train unit in position as elevator moves until it is at the upper or lower positions when the chocks are lowered to release the train. 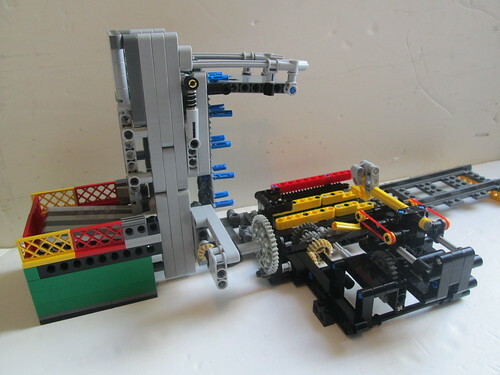 Elevator platform modified to include a worm gear in the drive to the elevator racks which prevents un-controlled rapid premature descent. 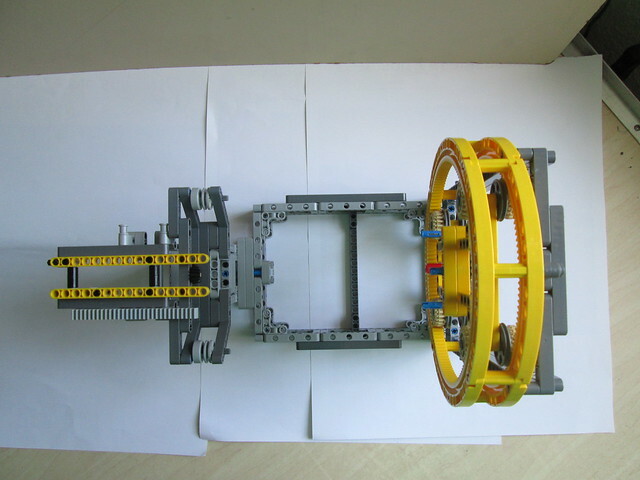 Drive gear ratio to rack gear changed to achieve faster speed when using a worm gear. Counterweights used to reduce load on the M motor and to balance the elevator speed up & down. its the same as height as Rotary Dumper with the Akiyuki base., but can be built to any height in multiples = to 4L racks. 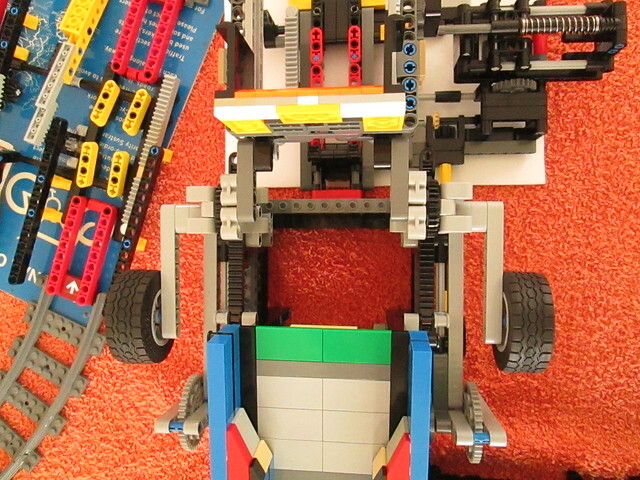 Uses two shock absorbers to assist with the lift. 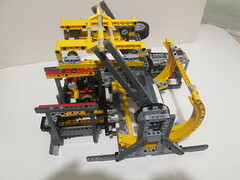 The two shock absorbers are replaced by two counterweight arms. 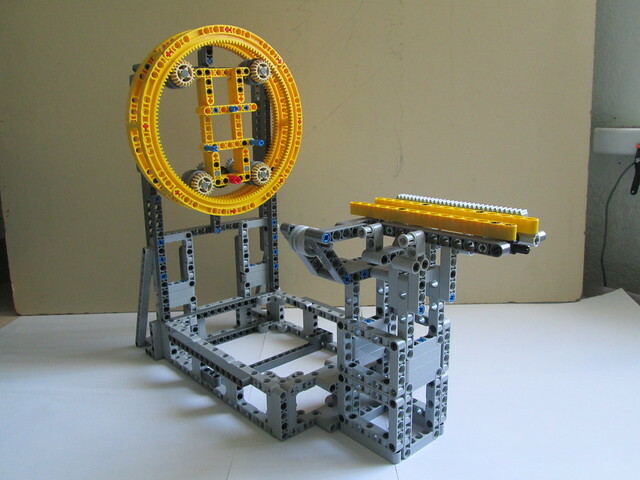 with Lego wheels with 62.4 x 20 tires. Image shows reverser with shock absorber but changed to rubber bands. Mod by Doug72 with contribution from @dunes. 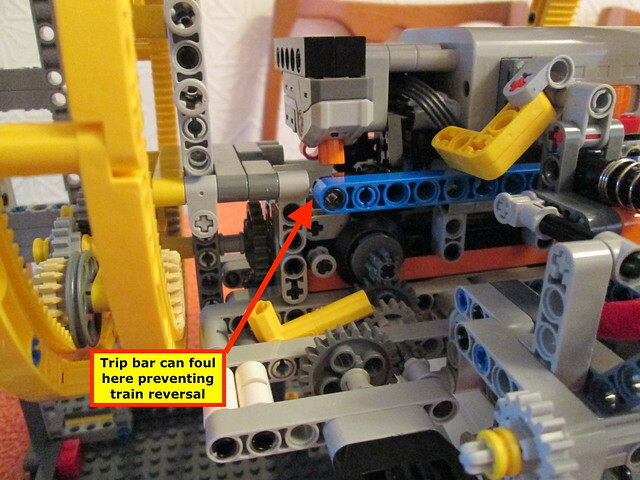 MOD:- One reverser re-positioned so trigger arm strikes the train trip bar centrally. Both reversers use rubber bands instead of shock absorbers. 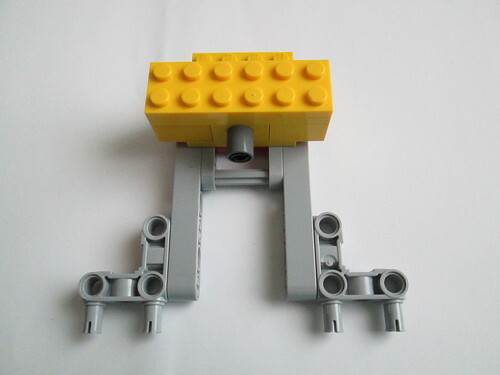 The Lego Double Crossover, is very hard to obtain, unless you are willing to pay a very high price and also requires a modification to set the switch blades correctly. 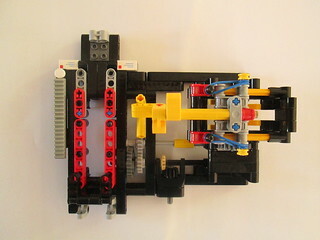 Instead a TrixBrix basic 3D printed version is used and as all switches are independent it requires no alterations. 7/. 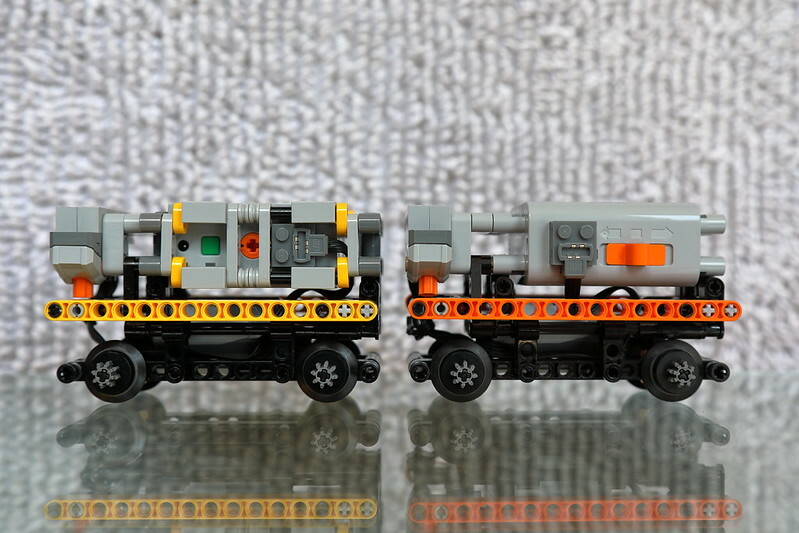 Train reversers - normal and Vee type MOD by Doug72 Instructions by @dunes. Shock absorbers replaced by rubber bands. Trigger arm can be modified & shortened by 1/2 L when required. 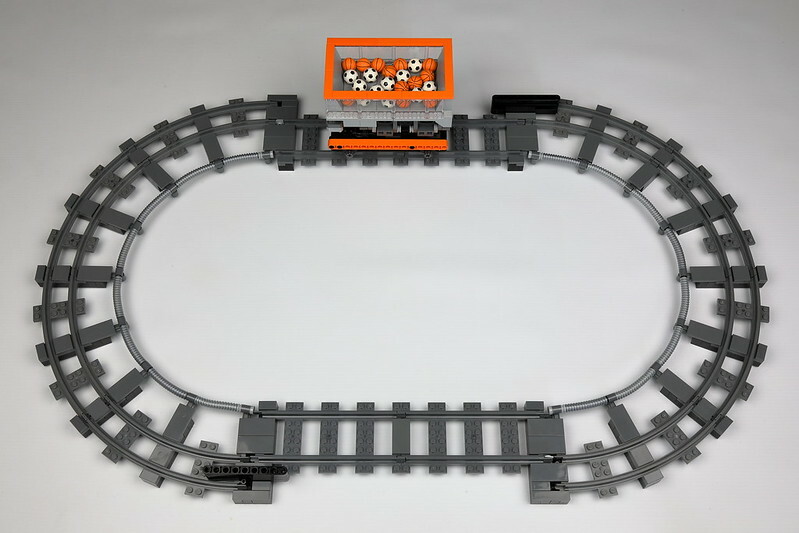 Uses Narrow gauge track but brick slopes are no longer required and replaced by flexible hoses. Passing module is now a parallel waiting station to sync the trains so they don't collide. Able to deliver up to 30 balls per loading using a two lobe reverser. 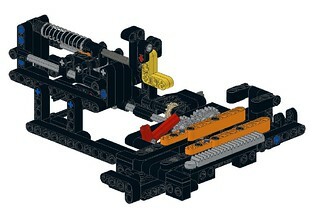 20/12 step up gears to keep chain in sync when using small 6 notch sprockets for the lift chain which has 24 links. The carrier is lifted off the train and swung up & over to the loading point, once loaded it is then swung back and placed back on the train which then departs. See page 19 Sunday December 2nd for details. 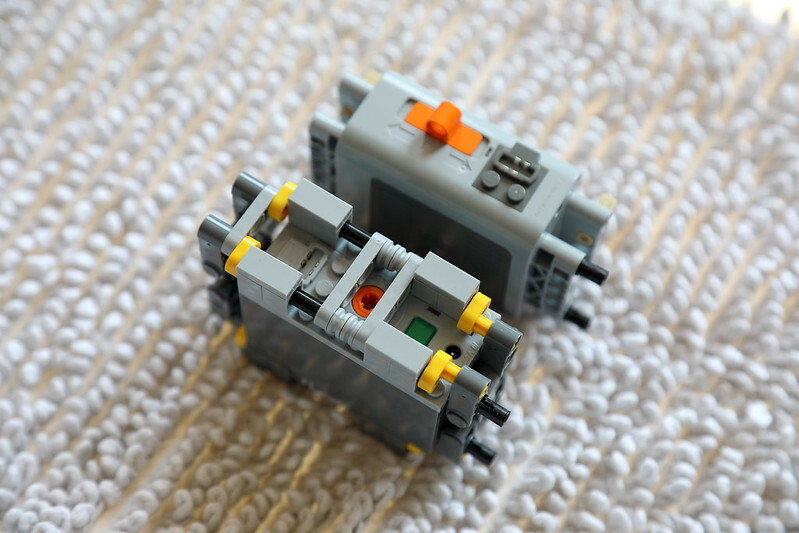 Other GBC Train Modules NOT directly compatible with the Akiyuki system. 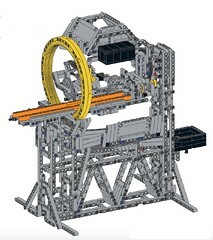 Self contained module with Rotary Dumper, a vertical ball lift and return ball conveyor arranged in a closed loop. 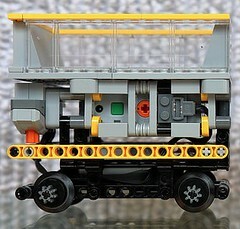 The train does not rotate in the dumper and is connected to ball hopper wagon by a rotary coupling. 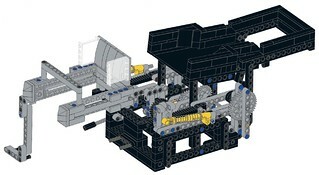 One reverser drives the vertical ball lift and the return ball conveyor, the other reverser drives the Rotary Dumper. Could be re-configured for use with other GBC modules at each end by reversing the conveyor to face the other way from the Rotary Dumper with GBC boxes, and driven by the dumper end reverser. @Jonas Thanks for posting that. I am trying to figure out how to link topics in the main GBC Akiyuki Project thread to this topic, I can only link to a whole page not an individual posting or should they be re-posted here for the modifications and new modules such as your turntable ? @Berthil A loader hopper can be much lower than the existing module allowing balls to be picked up OK.
Just checked my Dumper MOD and there is enough clearance for a shoot to feed a smaller loader module. Rotary Dumper MOD by Doug72. 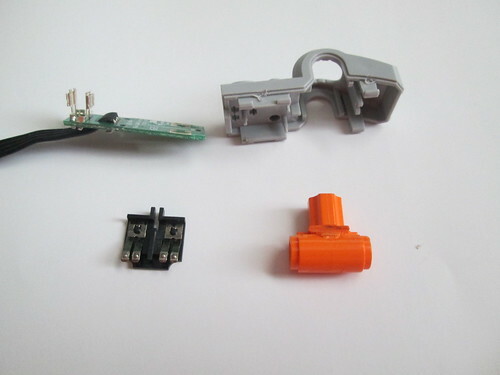 This MOD replaces the Z60 turntable and the Cam lock system which had proved to be unreliable. 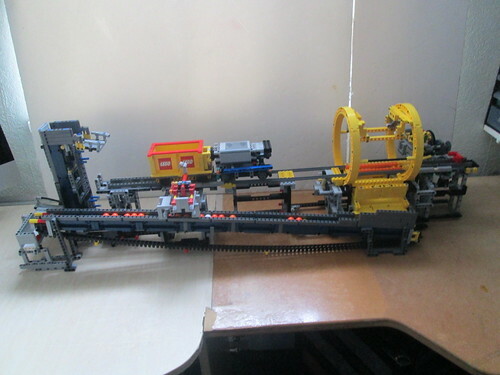 The output from the train motor drives the gearing within the static double support rings (LH side) to rotate the dumper, the gears are syncronised with the trip mechansim to release the train car when tracks are in line. A prawl holds the dumper stationary until next the train car enters. Video - Rotary Dumper - Elevator combo. Having received the extra 4L gear racks and after correcting a few issues with alignment of the dumper rotating ring final testing was successful and it is now working well without the use of the Cam Lock system for the rotary dumper. Some issues with train not leaving the dumper - all due to sticky trip bars on the train units. Some extra rack sections added to ensure train moved between dumper & elevator. 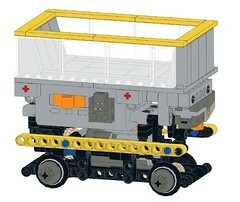 Extra weight added to the ballast box on the dumper which helps with the aligment of the track when train is released. 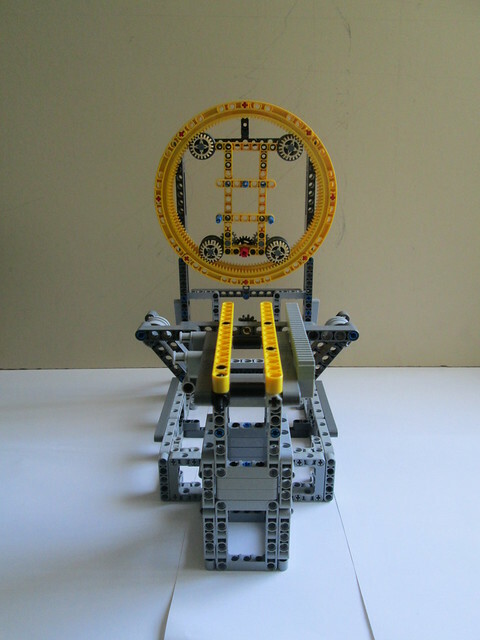 Next step is to build a ball collection hopper and link it to a loader module. Thanks for creating the topic @Doug72. For completeness below my trains of which one a modified rotary dumper with more rigidity and omitted bridge. I wanted to test the dumper 3 days and an event but (while working good at home) it wasn't reliable enough so looking forward to the modifications of Doug to make it reliable. The version Two trains work very well and run 2,5 days on one set good quality alkaline AA batteries. At that time this version was reverse engineered by Courbet but meanwhile Akiyuki has published building instructions of most of his Train modules. OK. I am also adding some information about my attempts in this field. 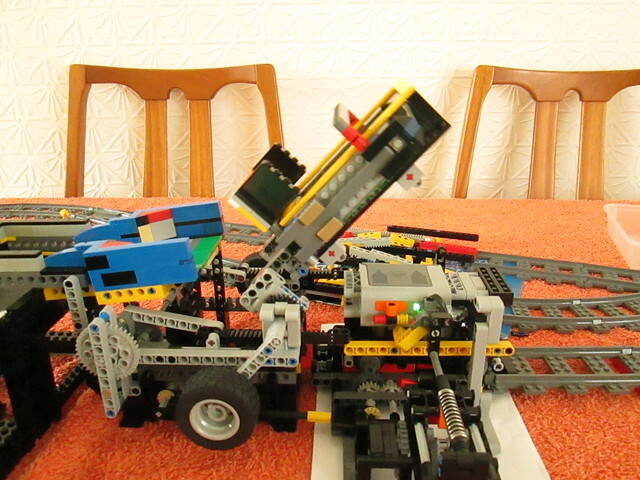 I have also tried to build a smaller version of the Rotary Dumper & Elevator (shown below). Unfortunately, it did not work reliably. 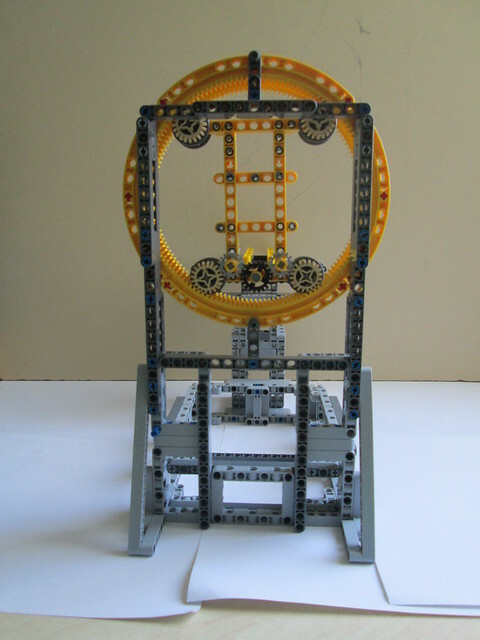 The gears often slipped and the complex movement of the rotary system got dissynchronized. @Jonas Thanks for the tip to study the video. 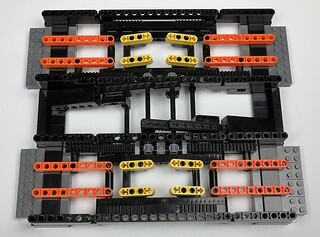 components required to build this module. Noticed on the video that the 5L beam link attaching to the slide that moves the point blade flexed quite a bit as it changed the point setting. Made a small MOD to stop this which prevents the 5L beam from lifting off the pegs on the slide that moves the point blade. Also added a longer 0.5 thin beam below to support the moving parts & used the old 4L universal couplings rather than the newer weaker 3L type. Parts use 2 x 1L beam / 2 x 3/4 pins / 1x 3L beam / 1 x 0.5 x 7 thin beam. 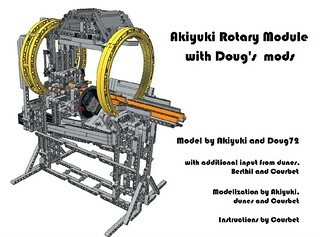 Now adapted the @Jonas turntable for the Akiyuki train system to give 90. deg. turn, very useful for a more compact layout. As I don’t have any of the correct shock absorbers - sometimes this module was reluctant to raise the ball hopper to discharge balls unless restrict the number of balls. I have now made a simple modification that now means I can raise many more at a time by using two counterweights arms instead of two shocks absorbers. Also much less expensive and operation smoother. 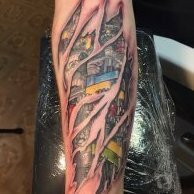 The photos show how this was achieved. @Berthil said:- I think you need more height to get the balls exit high enough for the next module however. Train loader MOD with low level entry for balls. 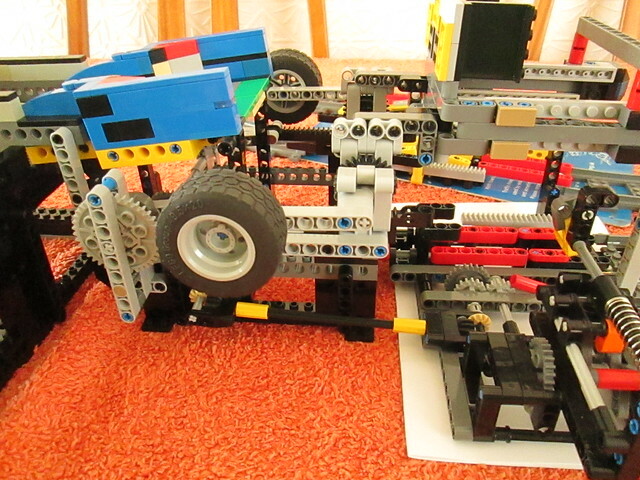 Now managed to build a loader module with low entry - without having to raise the rotary dumper or the elevator. Ball collection hopper and chute installed as low as possible and still allows dumper to rotate without any fouling. 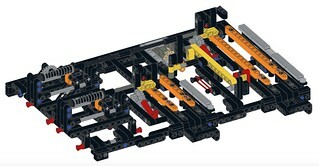 Axle for conveyor drive gear is only 4L above base. It was a very tight squeeze !! In order to do this I had to use a small sprocket wheel with 6 “teeth” for driving the conveyor. 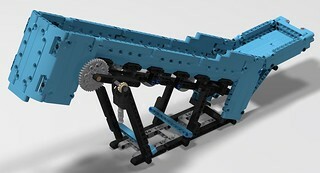 This affected the timing of the conveyor belt, as the Aliyuki version uses the large sprocket wheels with 10 “teeth” and 48 track links for the conveyor. Took awhile to find a solution but turned out it was quite simple. 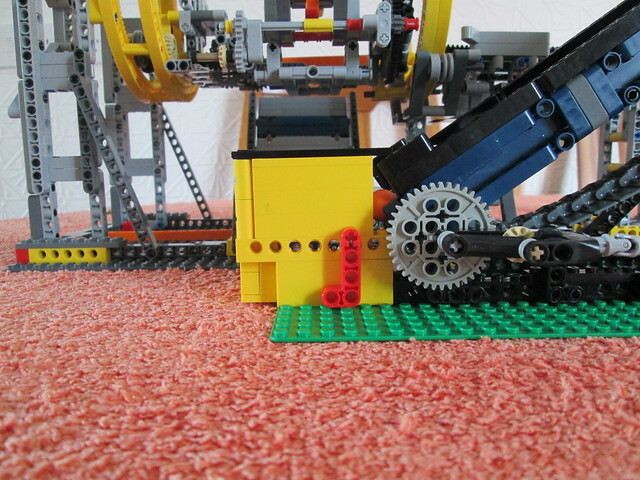 I revolution of 40T gear when using a small sprocket moves conveyor only 6 links. This was achieved by modifying the output from reverser from1:1 to 1: 1.666r using 20T & 12T double bevel gears at right angle configuration. 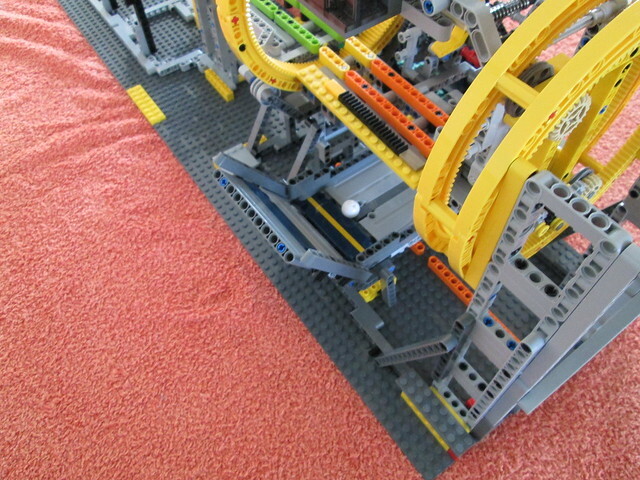 Biggest problem was stopping balls jamming as they dropped off the top of the conveyor into the train hopper - eventually solved after many attempts and chasing balls all over the place. Rotary dumper collection hopper & chute work OK but need improving. View showing low level entry to loader. Red 2 x 4 beam indicates height of input to conveyor. Vee reverser now added into circuit. 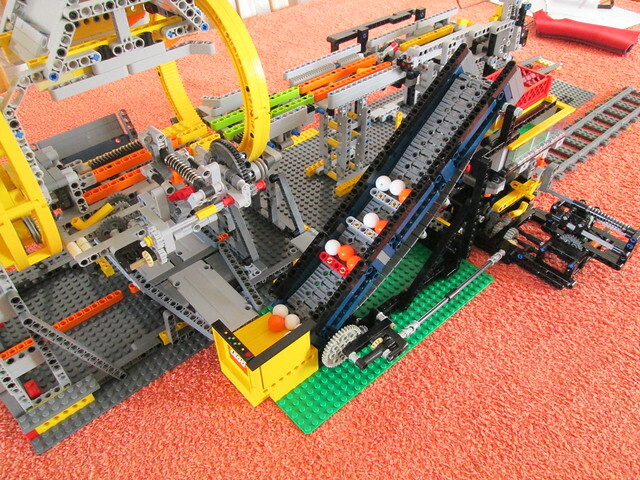 Closed circuit now tested and works well, just need to add more 5L beams on the conveyor to load more balls per cycle. Some fine tuning made to the rotary dumper hopper & chute to ensure balls don’t snag. The Rotary Dumper is very consistent and reliable but trip bars on train units have to be free moving and unimpeded by PF cables.. Extra bars added to my bespoke loader conveyor to carry more balls per trip. 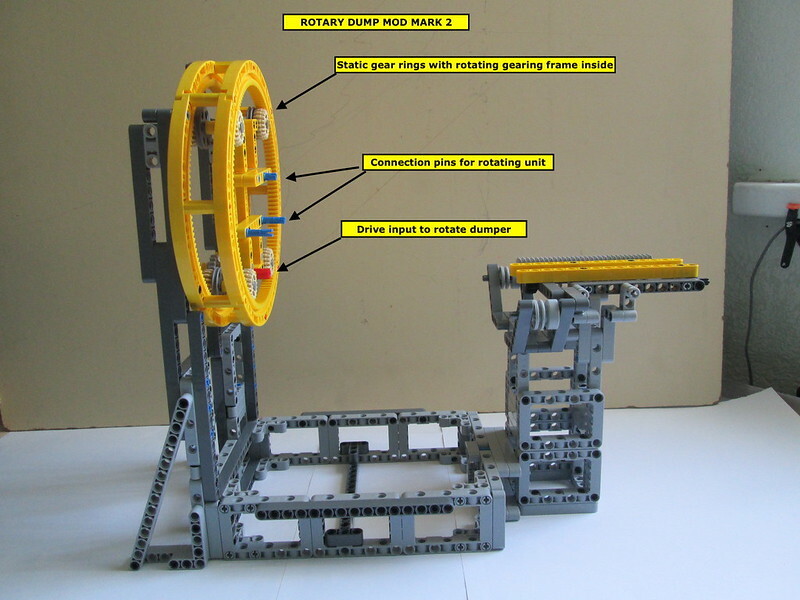 I am unable to make instructions for the rotary dumper but I can list the modifications & describe them. 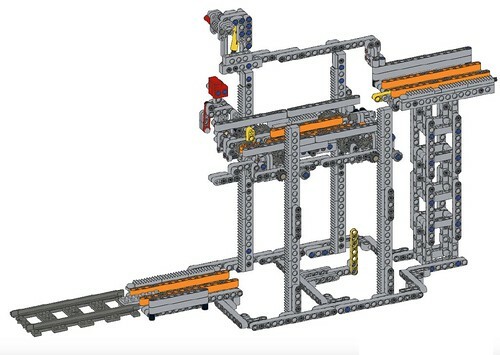 Would reccomend that anyone building this to raise the rotary dumper & elevator modules by at least 4L to get more clearance for the ball hopper & chute and a better slope. VIDEO: Rotary Dumper in action on a closed loop. You did not give up and you succeeded, eventually. Congratulations. Moreover, your solution seems to be more robust that the original. Can anybody explain how all these works??? Only power source is under the carriage. 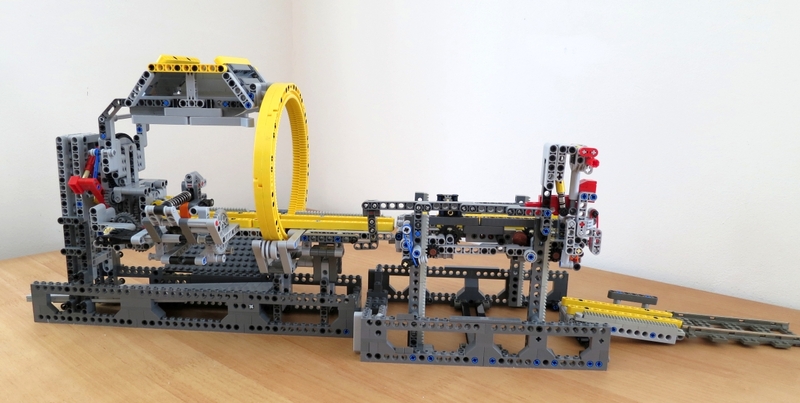 The train unit is the ONLY power source, as it arrives at each module the 8T gears on the end of the both axles engage with the gear system on that module to drive it. 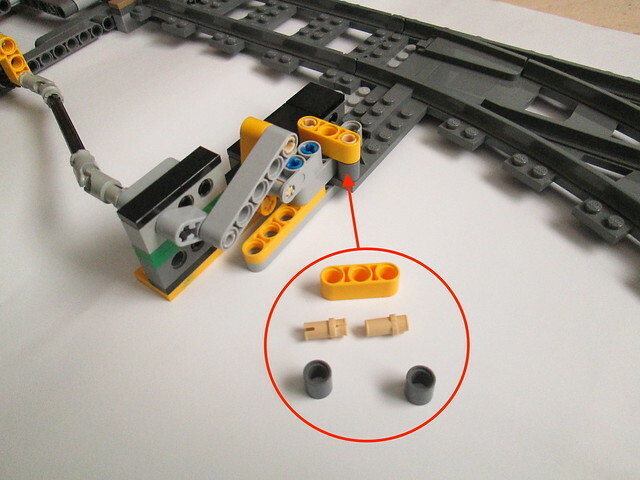 The bars on the side of the train unit are tripped by the module to reverse the motor and the train leaves that module to proceed on to the next one etc. So, the motor hidden under the Battery box? Some cosmic skills anyway for my understanding! Will try to learn this deeply! Thanks for explanation! 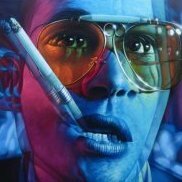 Watch once again - i bit understanding appears! No words to describe! So fascinating!! Correct take a look at the ilink to the instructions in the 2nd post in this thread. Thanks for your comments - I was determined to get it working. Found another issue in the dumper which now fixed. I have built two units - one behaves OK the other sometimes failed to reverse especially when in the rotating dumper module. 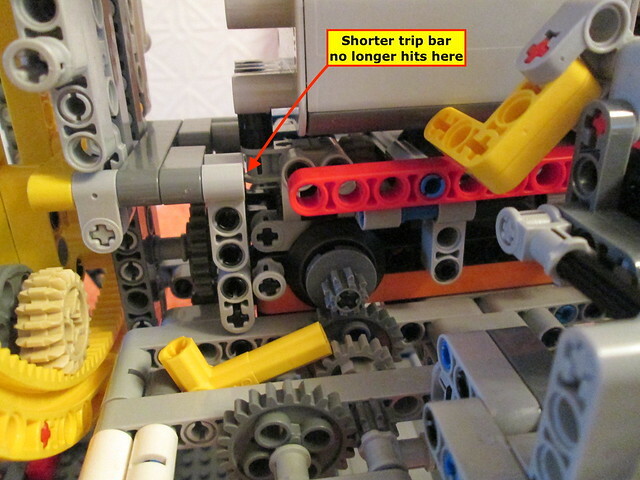 After careful observation found the the 15L trip bars can snag on the stationary structure (see photo) and not allow the trigger to push bar over far enough to reverse the train unit. I have wondered why the trip bars are so long as trigger hits the middle of the bar anyway. Now fitted 13L side bars and both train units work OK in which ever direction they are on placed on the track. I built 2 reverse units and 1 train unit to start with this train system. And switching does not work at 50% of the time. the force is not strong enough to push. any tips to optimize the switching? Take the switches apart and veil away the notches or use very old switches which do not have notches. You need to use the old style PF switch which has the small black pole reverser switch which does not have notches and is much freer in operation or if using the newer type without pole reverse switch and do a Berthil suggests. Thanks for the tip. works like charm. Mine is so free now that the switch does change over as I had cut off the small projection that engages with the slide switch part. My Rotary Dumper MOD - loader - elevator loop. Issues with balls hanging up and not loading on the conveyor belt as slope was not enough to keep some balls moving which were resting on the small hole in the ball. Dumper hopper and chute re-configured to give a steeper slope into the unloader, balls now load OK in groups of 3 balls. Carried out a prolonged test run with fresh batteries in the train unit a and rotary dumper performed well without any train car hang ups, jams or lost balls for over a couple of hours of continuous running until train battery ran out. 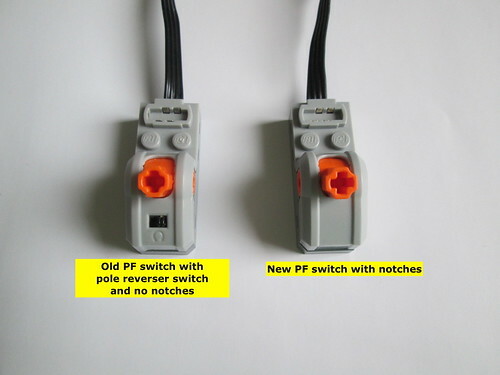 Hello, does anyone bought the older PF-switch and important where? At BL I look for bb339c02, but once I've got delivered the new ones bb339c01 (numbers are to make it easier ), so next time I mailed and got the answer, these are the new ones. Yes but very expensive ! All countries £2.48 to £13 used / up to £17.00 new. I,m OK as I still have a few spare. Having proved that my modification is both consistent and reliable for rotating the dumper and then releasing the train unit without use of the Akiyuki cam lock system, I have decided to build a Mark 2 version. The whole Mk 1 dumper was too low for the ball chute to be effective and also was a struggle to squeeze it in. The studded base plate on which it is dumper module was mounted is “flexible and had the usual issues regarding 1/2 stud offsets when lining up various parts. 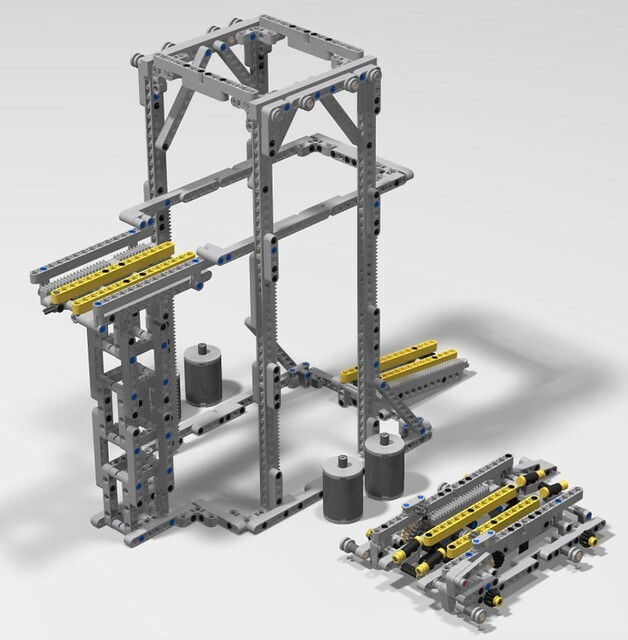 The new build will have a more rigid structure and be raised by 4L to give more room for the ball chute leading the loader unit. 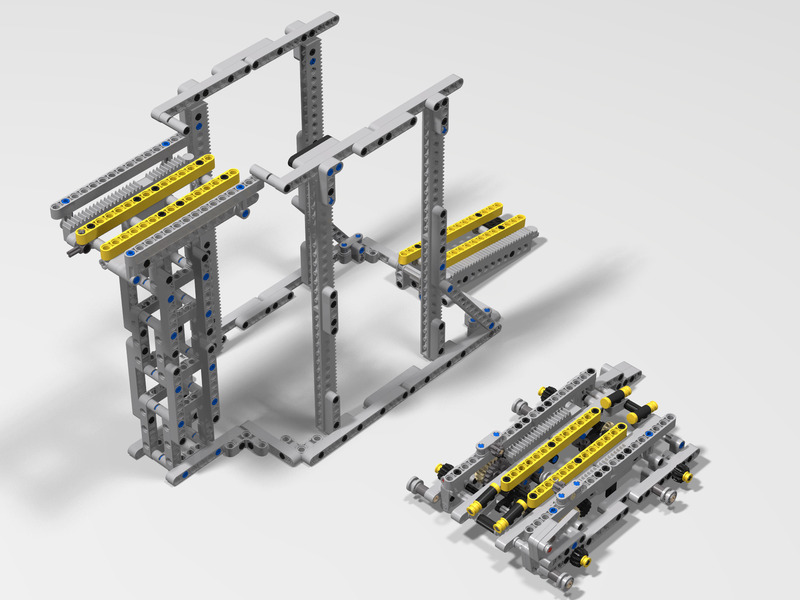 This will also require the elevator module to be raised by 4L = one rack piece. 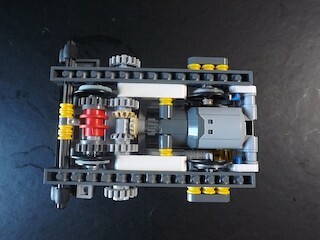 At each step of the rebuild I will post images which should allow anyone to reverse engineer my modification. Nice! I am following this topic with great interest.